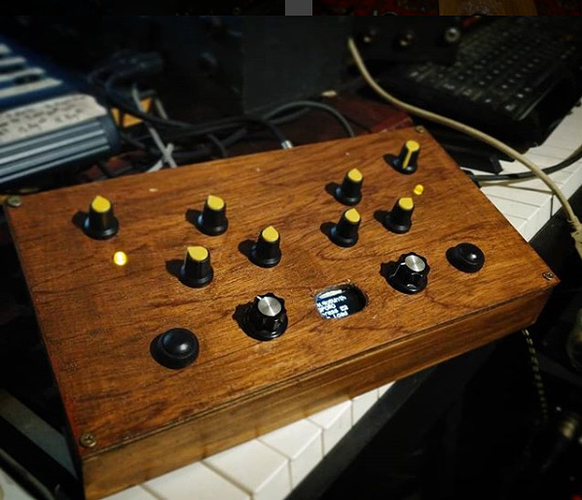 One thing that might be cool though, is the possibility of connecting the Controller and Axoloti together with some kind of multicore cable, so you could put the controller in a desktop box, and plug it into a Eurorack-mounted Axoloti. its connected via a standard 6 (?) core ribbon cable.... so the axoloti control does not have to sit directly on the axoloti core. Ah, good to know, @thetechnobear. It would achieve the ability to make a module IF you wanted to. If it is too big, then it would be impossible to do so. There are many people, myself included, who are making Axo modules already and a Controller module sitting next to it would be GREAT. The big question I have is WHY NOT? What would make it horrible if its was 4" tall? Why would that be unusable for all the desktop folk? It would cost no more money to make (PCB cost are by square inches and hole count). I am amazed by all this push back for such a simple request. By doing this one simple thing, you can increase potential sales without harming current sales. HA! I just looked at the old Axoloti Control webpage and the size of the board pictured is "board dimensions: 160×100 mm" so that means it ALREADY is under 4" tall and is Eurorack size compatible. If they don't change that then all is golden for me. Johannes strength is in engineering, quality control, and having an awesome hair-job, but weighing-up the pros and cons of specific designs from a marketability standpoint is not a strong point of his I think. Whatever controller Johannes manages to pull from his tech-cave, I'll buy it no matter what it is. But I'm secretly hoping he's seen the benefit in unpopulated design, that the controller will be such a thing, and that Axoloti MK-II will be unpopulated to match. With the controller, for example, the most complex component is the display, therefore, perhaps the display could be hard-wired to an otherwise unpopulated board, where the controls and everything else, is connected by cables to allow complete freedom in layout of the controller. @Ersatzplanet current (?) prototype is 165x85, so will fit... and the ribbon cable means it should be easy to mount it on a eurorack panel, which could then use the spare space underneath for useful eurorack stuff like cv i/o. as for the rest, well - you will probably get as many opinions about which way Johannes should go as there are users - that's the nature of something like axoloti, different users doing different things, means its strengths and weaknesses are different for us all. I wonder what you know that we don’t. This is great! reduced in height from the original 100mm. That leaves a little over 3/4 of an inch which is plenty for jacks to go there if needed. Well let's look at this logically. It's a controller and it's designed for audio hardware, so the only thing I can think of right now is that he decided to go super-futuristic and incorporate a projection lens so that it projects virtual holographic controls in 3D space. It would also explain the delay in bringing it to market, cause perhaps he's been experimenting to find the best quality projection lens for the on-board projection unit. lol , no ... its something quite small, but i think improves usability a great deal, but was i understand it quite tricky to get done... anyway, i don't want to say more, as things could change, might be dropped etc. Led rings for the encoders maybe?? It is probably something to do with an extra feature but without impacting on its efficiency. Something easy to implement, but difficult to achieve same processing efficiency without it. Otherwise why else would TB say "might be dropped". I have to agree that having some kind of "minimum standard" hardware would help the axoloti platform a lot. Patching is very time and brain consuming, and even simple things like remapping controls can be quite confusing for a simple musician / user. For the moment, I think the user base of Axoloti is orientated towards "geeks" more than "musicians". And it's a shame, because axoloti has so much to offer to artists, and I think artist will have just as much to offer back. I think the axoloti control will be a big leap in the way we could share instant usable patches. Having tested (and made two boxes with) two rotary encoders and a OLED screen, I'm realizing how complicated it must be to implement such an interface into the axoloti workflow. I'm actually having great fun trying out sub menus and such, but I'm sure it's much more fun for coders. 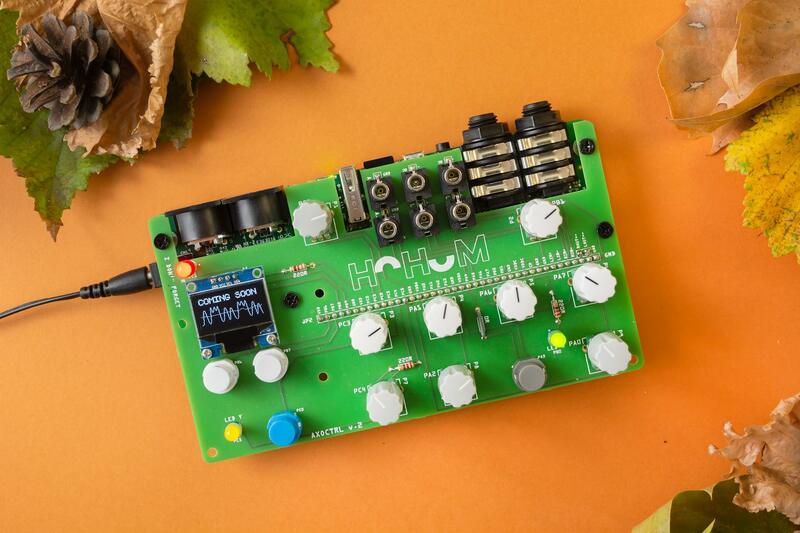 If someone gets out these modules at a reasonable price (250 € maximum), I couldn't imagine any musician not having at least one in their arsenal. And sharing patches for each device would be so much easier. I'm now, for some silly, probably f-Artistically obscure reason, making an "Interactive Audio Adventure" that takes you across a load of different patches, where you need to unlock a certain "audio quest" to continue your adventure (change patches). MIDI CCs should automatically be mapped to the entire range of any type of parameter or knob assigned to them. Not so much the the accelerometer, I have to say. How about WiFi access, for wireless control via OSC? Or, maybe more likely (and higher up my 'want' list), an RGB OLED display? Saw these on 2 different prototypes, so propably they'll make it! Yeah I totally feel the same. I mean I'm a musician and got into DIY through axoloti, wich is great but at the same time I'm really tired of this DIY buisiness. Somehow working on my axoloti projects has turned from fun patching into problem solving. A more dedicated and ready hardware would put the fun patching exploring aspect a bit more into the foreground and attract a lot more musicians. Good suggestions! I also think it would be cool to have more analog IO extension shields, like mic preamp, (ultra) HI Z preamp for guitars and piezos, output boost etc. I mean there is solutions out there already, but my experience with adding these kind of components to my setup always ended up sounding really noisy and unusable and ended up in me solving problems instead of making music. Is there some good news for early 2019 ? For now their website is limited to newsletter subscription, but there is some info on their facebook page and pictures of it on instagram.